I watched Satya Nadella’s excellent presentation and the slick demo by Julia White last night. I was hooked, I downloaded Word, Excel and PowerPoint onto my iPad (Download here), dropped a handful of complex test documents into Onedrive, entered my Office 365 password and was blown away. After years of universally useless Office document viewers and editors on the iPad finally I had almost full fidelity viewing and useful editing, I gasped when I saw revision marking is all it’s glory. I did quickly find some bugs though and wasn’t at all impressed with Office for iPhone which had truly terrible fidelity, definitely an app for when you area really desperate. I still think the iPad is a productivity destroying creation device, but as a reader, email attachment viewer and emergency editor it’s fantastic. If you want to get real work done though, get a backpack and carry a laptop (I recommend a Thinkpad). Microsoft’s official blog post is worth reading. For now, know this: Office for iPad is surprisingly impressive, almost disarming. It’s the real deal, a full-featured set of Office apps that looks and works naturally on the iPad. It’s a sort of “best of both worlds” scenario for those people who do need Office functionality and have chosen iPad, a way to bridge the previously fuzzy area between the PC and the iPad. Microsoft could have simply mailed it in with this release, but they didn’t. And combined with the impressive arsenal of other iPad apps that Microsoft makes, the firm is really making a case for its ability to deliver services—and apps—to the devices people are really using. The new normal? I think so. Office for iPad is highly recommended. the one chart you need to see if you are trying to figure out what you get for free vs. don’t with Microsoft’s new Office for iPad. I’m even more impressed by the great pricing model (free to read and present, Office 365 subscription to create) and the broader Office 365 strategy, maybe these apps will be free on Windows (like Apples are on iOS). As I watch Microsoft’s cloud strategy unfold with a rich integrated Microsoft services ecosystem and a strong developer and third party integration story (many partners already) it’s soon going to be hard to justify on-premise deployments of the standalone services (Exchange, SharePoint etc) for all but those with security constraints. It’s instructive that Microsoft is already cloud first and de-emphasising the individual services in favour of the integrated (office 365) solution. In fact I thought the old product names were banned in the presentation, when an app popped up displaying SharePoint in it’s title bar, Julia said the S word, stumbled and corrected herself back to Office 365. 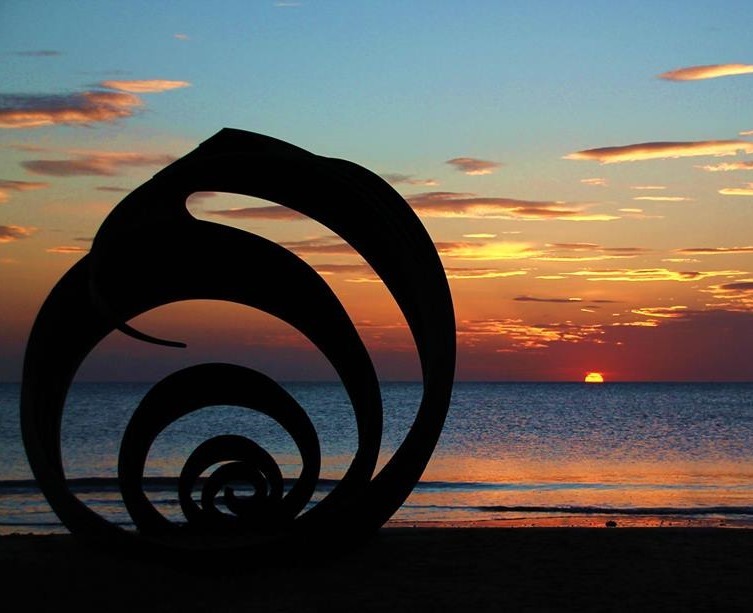 The picture above is of the sun setting on Rossall Beach, with the shell sculpture in the foreground. We definitely saw the sun setting on the old Microsoft today, we will see the sun rising on the new Microsoft at Build next week. Next story What Type Of Team Do You Need?